In order to be prepared to serve our community in the wake of a San Francisco oil spill, The Brod Law Firm follows oil-related disasters across the nation. Just last week, federal investigators revealed the results of their inquiry into a 2010 incident in Michigan. For the Northern California region, this report is especially notable because it bears several similarities to the explosion that rocked San Bruno during that same year. MSNBC is one of several news outlets carrying the Associated Press story about the most expensive onshore oil spill in our country’s history. On July 25, 2010, at approximately 6 P.M., oil began leaking from a 30-inch pipeline in southwestern Michigan. Alarms sounded repeatedly at the control center of Enbridge, Inc., the line’s Canadian operator, but staffers misinterpreted the warning. Overall, the ruptured pipeline dumped approximately 843,000 gallons of heavy crude into the waters of the Kalamazoo River and a tributary creek. About 320 people reported health symptoms that officials tied to oil exposure and the spilled crude fouled over 35 miles of waterways and wetlands. Cleanup costs have surpassed the $800 million marks, more than five times more than the second-costliest onshore spill in U.S. history. According to the National Transportation Safety Board (“NTSB”), Enbridge failed to respond appropriately to the Michigan catastrophe and also neglected to adequately address structural problems that had been detected years prior. By 2005, five years before the spill, the company knew that the pipeline, located about 95 miles west of Detroit, was cracked and corroded. According to the report, Enbridge did not grasp the significance of the developing cracks and did not appropriately investigate other findings about pipe wall thickness. Enbridge did not perform excavations and visual inspections, actions that NTSB investigators believe could have prevented the rupture. 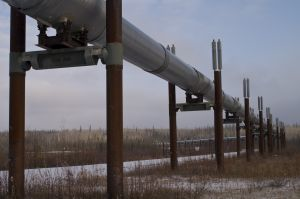 Investigators believe that trapped moisture caused corrosion on the pipeline, leading to cracks that eventually linked together to cause the rupture. Additional problems occurred after the 2010 disaster was underway. Enbridge failed to realize that the pipeline was spilling oil for over seventeen hours. When a worker did find the leak, Enbridge personnel ordered two restarts. The company’s repeated mistakes effectively pumped 683,000 additional gallons of oil into the ruptured line. The NTSB report also put fault on the government, noting that weak regulation led to an inadequate review of Enbridge’s plan for addressing a potential spill. Federal law does not give the NTSB the authority to regulate pipeline companies, but the board’s safety recommendations carry a great deal of weight with both government and industry officials. When discussing the report, board representatives noted that the system delegated too much authority to the industry to assess its own weaknesses, suggesting that regulations need to be stronger so that they can take corrective action prior to a tragedy instead of only acting after a spill. The board noted that the similarity of the Michigan incident to the San Bruno explosion of the same year suggests further investigation into the industry may be warranted. Enbridge officials say that they have already taken steps to improve operations and training. They reported that they would study the NTSB report and are working to learn from the Michigan accident and to share the lessons with others in the oil industry. Still, the company’s CEO stated that their personnel had attempted to do the right thing and blamed the spill on a series of unfortunate events. Last week, the federal pipeline agency proposed a $3.7 million civil penalty against the company, a record amount. NTSB findings can also play a role in lawsuits. It is vital that victims of oil-industry accidents select legal counsel who can effectively represent them as they pursue their legal claims. Our San Francisco oil accident attorney has the knowledge and experience that is key to helping Northern Californians recover all the damages due to them under the law.